Any guesses as to what all this will cost? HTC isn't saying. We might still not know what the HTC Vive will cost, but the company keeps improving the hardware while we wait. The latest iteration is named the HTC Vive Pre, which adds a front-facing camera that developers can tap into. 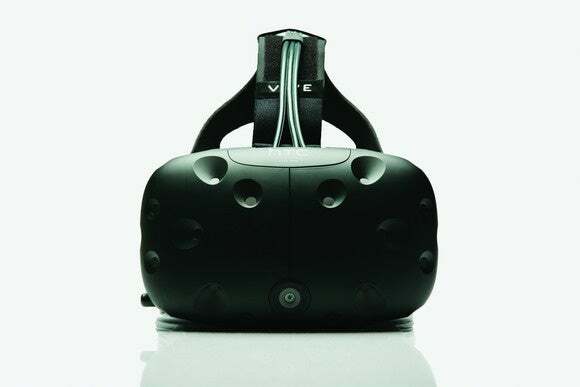 However, HTC executives said that the new hardware won’t delay the Vive any further. HTC said in December that it would push out the Vive’s launch until May 2016, without saying why. 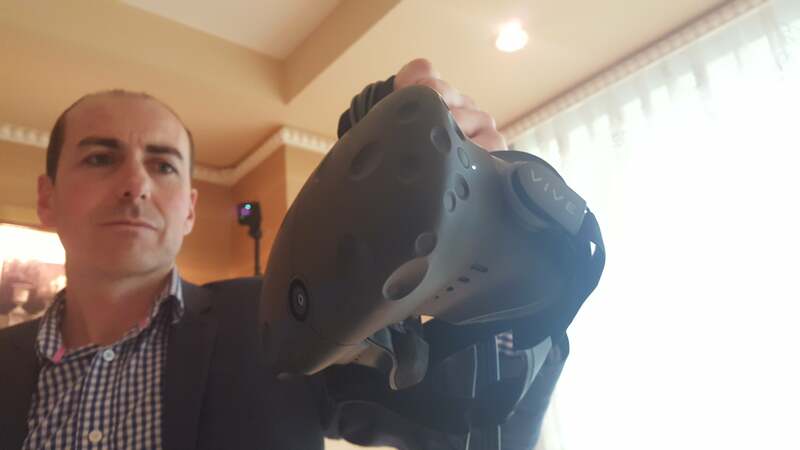 Graham Breen, the Vive project lead for EMEA, told PCWorld that that timeline hasn’t changed. And no, the company didn’t disclose the price of the hardware, either. 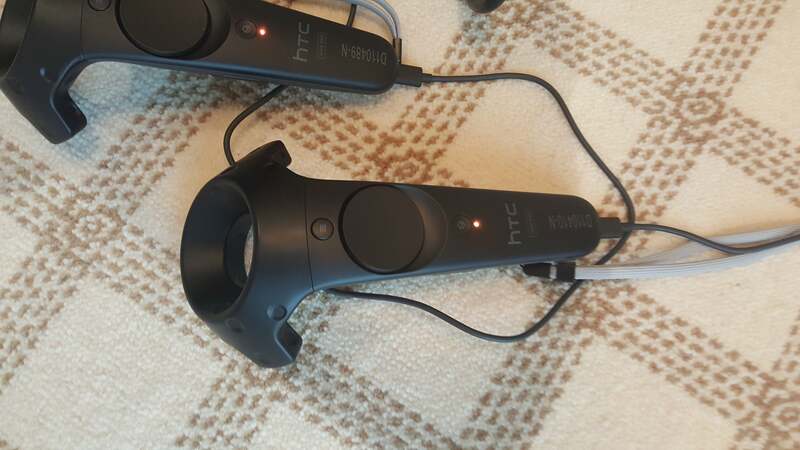 You’d probably have to examine the Pre closely to find any differences between it and the older models, though HTC said that the headset is more comfortable, and the physical controllers have been overhauled with softer edges and textured buttons. Aside from the camera, the functionality remains the same, Breen said, though with a brighter display. Keep in mind that a front-facing VR camera has been done before; the Samsung Gear VR uses the rear-facing camera of the phone you insert into it to achieve a similar effect. And for that matter, so does Google Cardboard. Graham Breen, the Vive project lead for the EMEA region, holds the HTC Vive Pre. The new camera adds a sort of Matrix-like effect to the world when you trigger it by tapping one of the menu buttons on the two handheld controllers. Recall that HTC’s Vive is more than the head-mounted display; there are also the two handheld controllers (complete with a trigger, thumbpad, a pair of menu buttons, a thumbpad, and a grip sensor on each controller). Enable the camera, and suddenly the world is full of blue, ghostly images of the physical objects surrounding you. The Vive hardware also includes a pair of “lighthouse” base stations that track your movements across a 15 feet by 15 foot virtual space. Come to the close to the edge of that space, and the Vive throws up a virtual “wall,” again with the physical objects near you displayed faintly behind it. The HTC Vive has a reputation for being one of the most immersive VR solutions coming to market, and it certainly lives up to it. HTC’s demonstrations at CES were apparently nothing new: one demo put me at the bottom of the sea on a sunken ship, complete with rays and a giant whale swimming around. Another put me in a quasi-dysfunctional office environment, asking me to answer phones, throw paper airplanes, and plug in computers by using the physical controllers. Finally, a 3D paint simulation from Google allowed me to draw fiery lines in the VR space around me, letting me walk behind and through them. The redesigned HTC Vive Pre controllers now have four hours of battery life. Subjectively, the Vive’s resolution appeared to me to be on par with the Microsoft Hololens, with perhaps some more detail. As you might expect, the Vive was far more immersive—the Hololens is marketed as augmented reality, and has a narrow field of view. I was completely unaware of my physical surroundings until I bumped into someone or they tapped me on the shoulder. There’s no real indication, yet, how the camera will be put to use, but we can guess. It’s possible that a developer could in fact harness the Vive’s physical camera to enable a Hololens-like augmented reality mode. At this stage, though, there just wasn’t enough clarity or detail to allow it to happen. But there was just enough resolution, combined with the Vive camera’s ghostly blue light, for me to hope that some developer ships a “ghostbuster” app. It’s made for it.